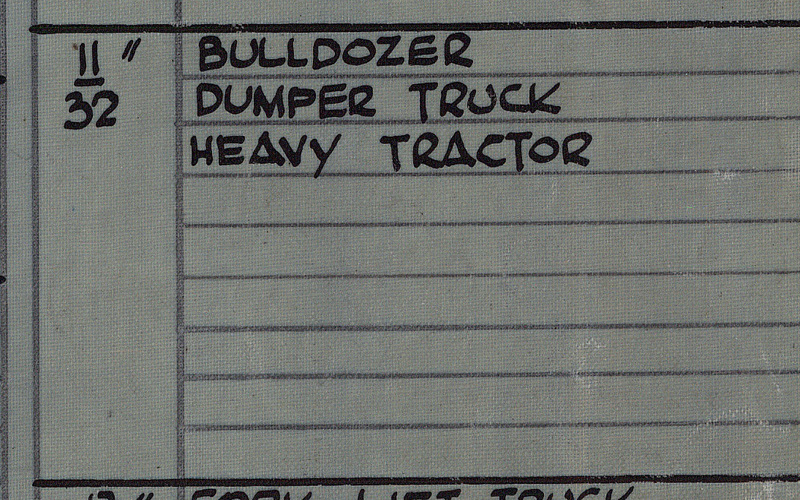 This is my 3rd version of the Muir-Hill Dumper Truck. Light yellow - number 562 in the bottom. Red plastic hubs with black rubber tires. Blue plastic driver. Sales number 962 with 962 box. 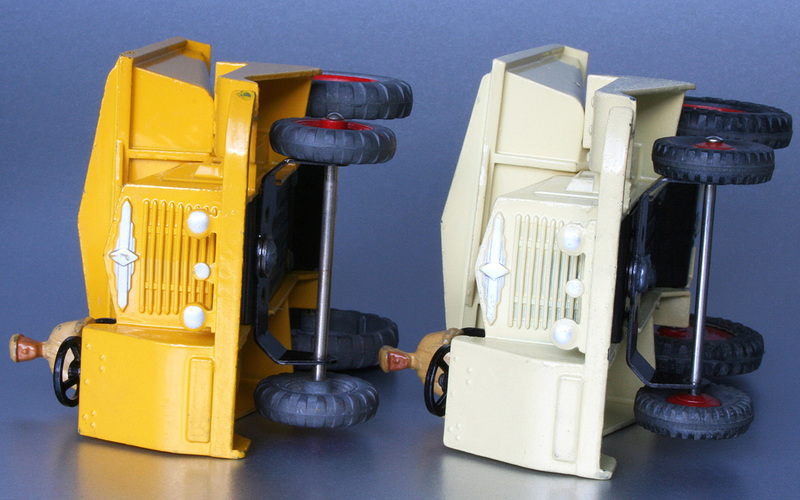 All my 3 versions are different in colour, hubs and tires and the driver is now painted blue. Be noted that there are more model and box versions. Additions are very welcome. My 3rd version Muir-Hill Dumper Truck with blue plastic driver. Sales number 962. 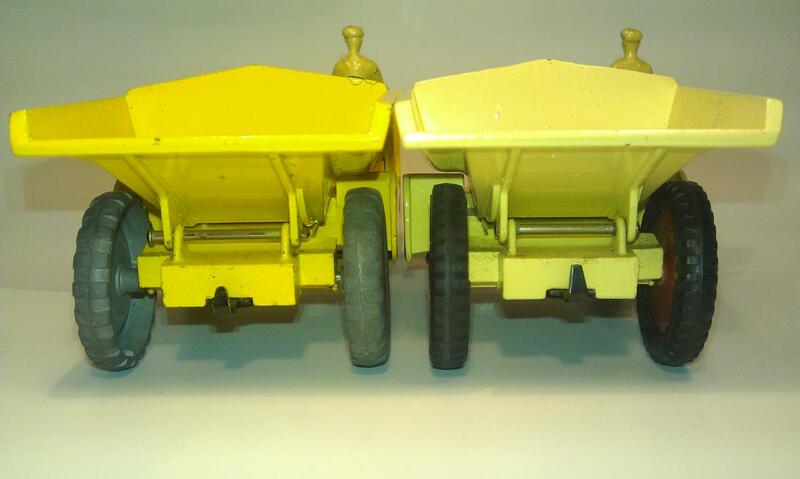 My 3rd version Muir-Hill Dumper Truck. Sales number 962. Number 562 in bottom. 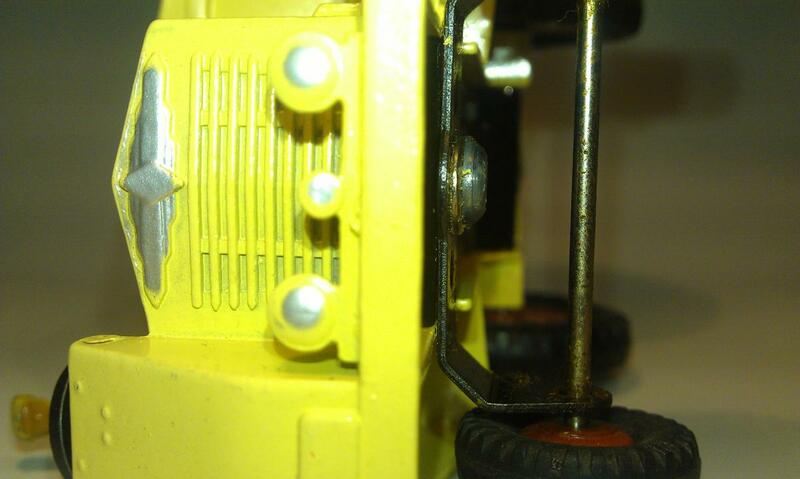 My 1st version: dark yellow - has no model number in the bottom and has a rivet in the notch to fasten the headlights. 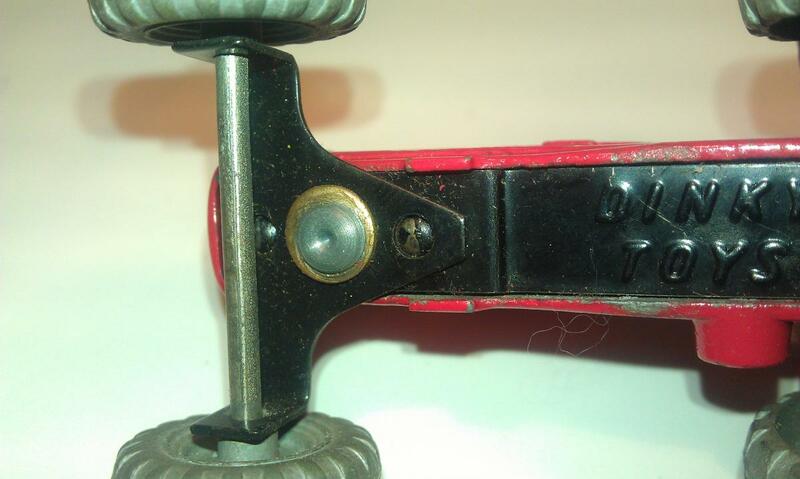 Metal wheels - red hubs with grey tires - cast tan driver (all like farm tractor 27a). 1st type box 562. 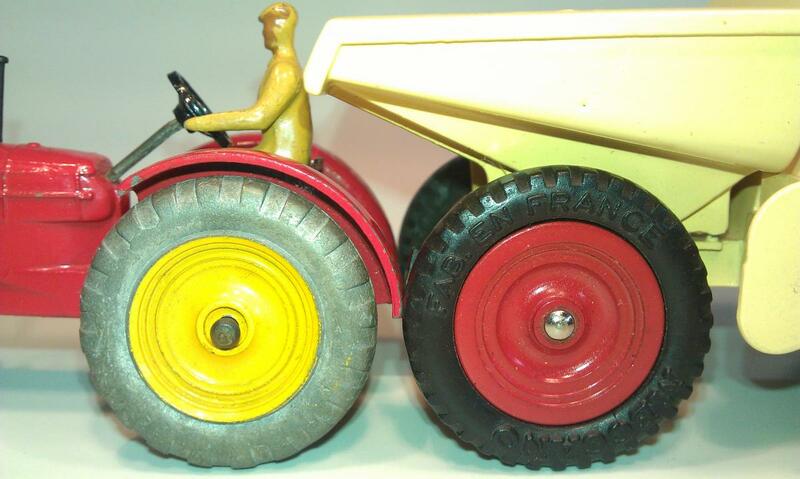 My 1st version Muir-Hill Dumper Truck. Sales number 562. Cast tan driver. 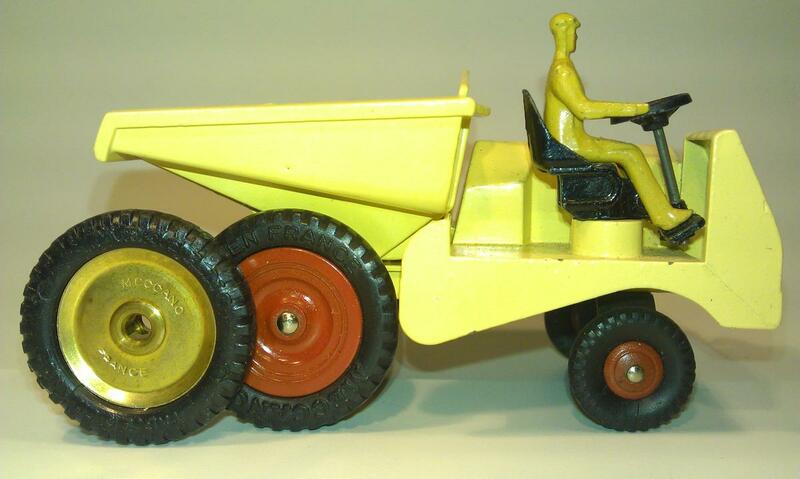 My 1st version Muir-Hill Dumper Truck. Sales number 562, but no model number in the base. 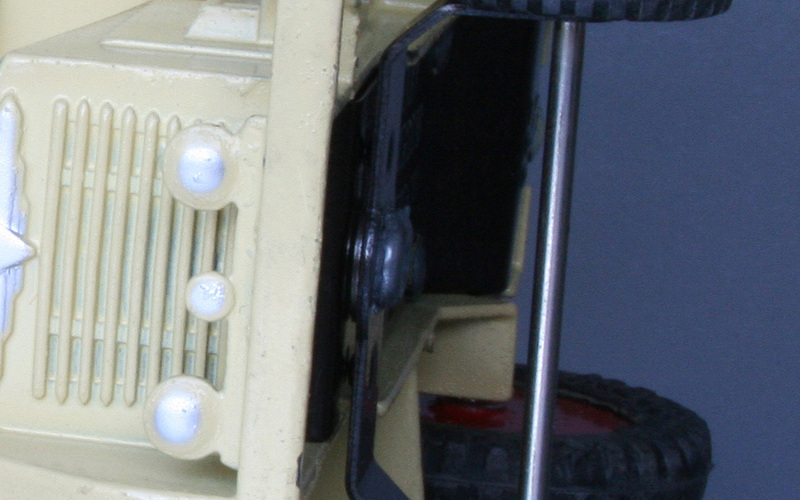 Note the rivet in the notch to fasten the headlights. My 2nd version: cream - French version with UK model number 562 in the bottom and French model number 887 in the base plate with Assemble en France Meccano Paris. Red hubs with black rubber tires. Cast tan driver. French sales number 887 with French box 887. This is a very remarkable British/French version. 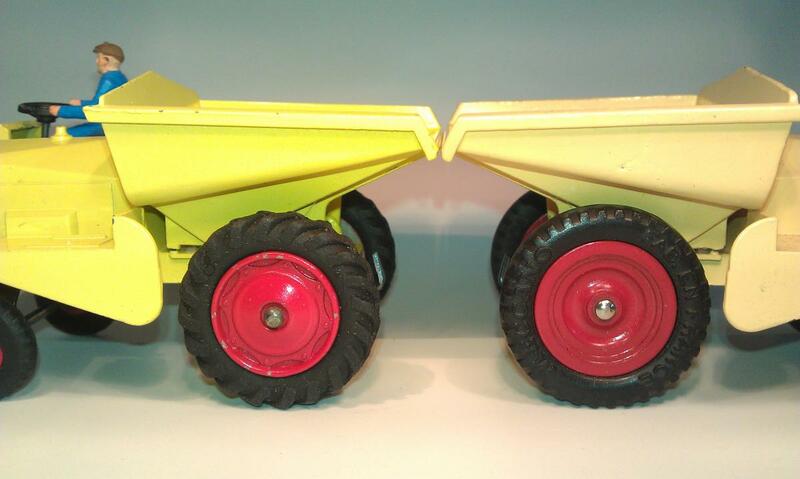 My 2nd version Muir-Hill Dumper Truck. French. Sales number 887. “Assemble en France Meccano Paris”. Cast tan driver. French box 887. 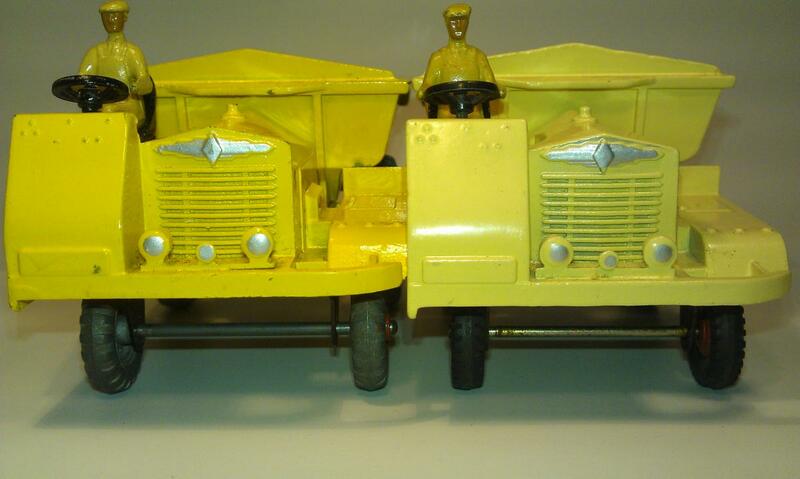 My 2nd version Muir-Hill Dumper Truck. French. Sales number 887. 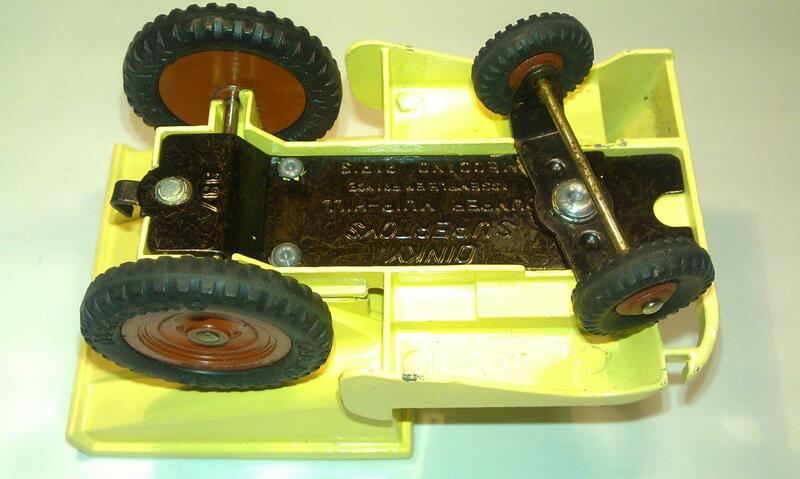 UK model number 562 in the bottom and French model number 887 in the base plate with Assemble en France Meccano Paris. Meccano Price list September 1948. Price 7/6. 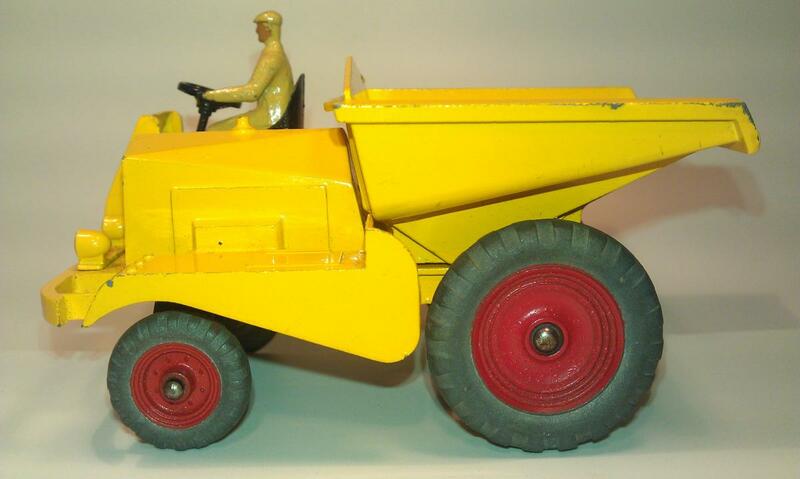 Based on the Muir-Hill model 10B "Hiway" Dumper Truck manufactured by E. Boydell & Co. LTD Manchester 16. 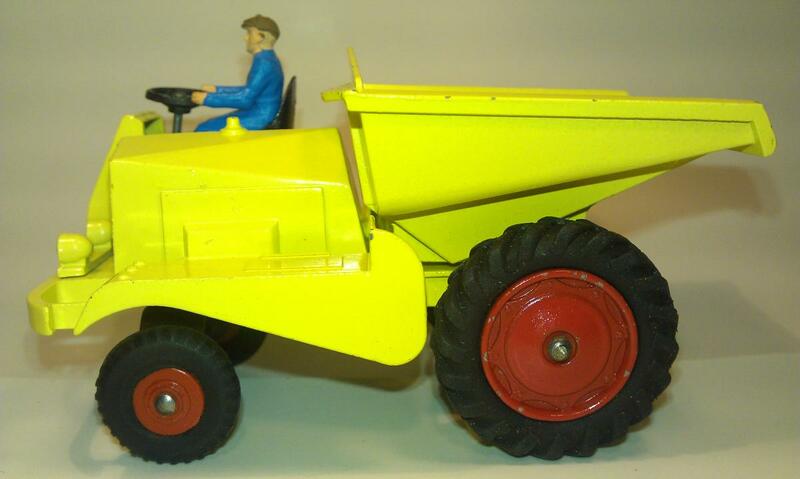 Advertisement Muir-Hill Dumper Truck model 10B . Courtesy of David Busfield. Real Muir-Hill Dumper Truck 10B in action under a cistern. Real Muir-Hill Dumper Truck model 10B. Note the plate 10B on front. 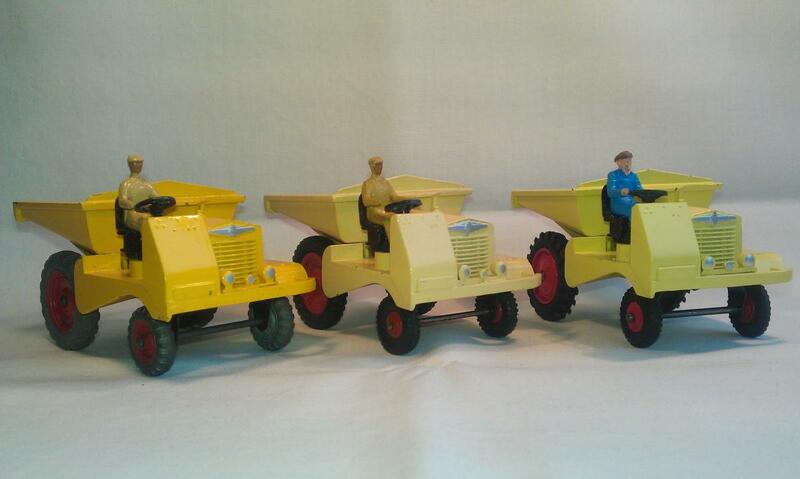 At the end I show pictures of my 3 versions Muir-Hill Dumper Truck together in full size. Jan, interesting rear tyres on your French version. Whereas the second Liverpool version has the same tyres as the later Dinky farm tractors, those on the 887 version appear to be the same as those found in "Meccano" construction sets, although these were usually grey, not black. 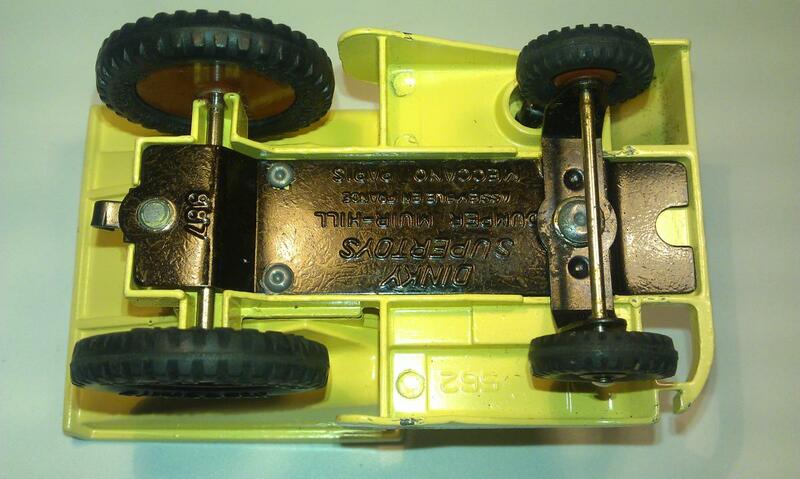 Is the word "MECCANO" moulded on the sides of the tyres, as it was in the construction sets? Kevin. 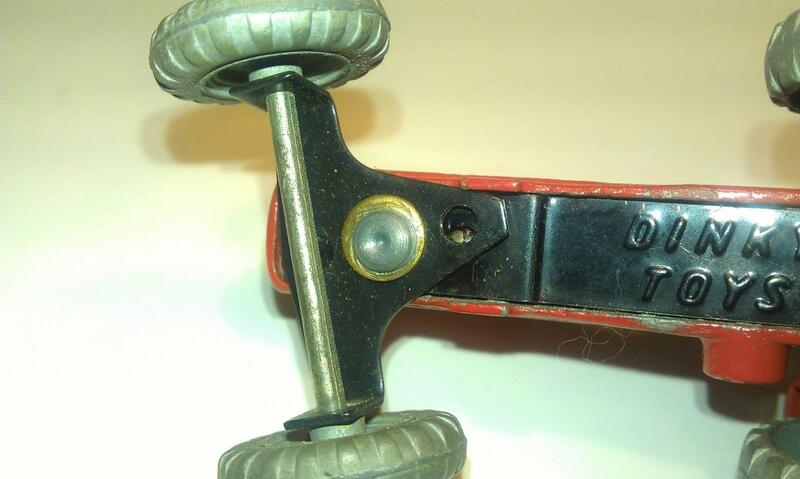 I add a close-up photo of the Meccano rear tire of that French model 887, with a Meccano tire from my French Meccano 4 drawer cabinet with Meccano construction set. My French Meccano tires are black. So I always have spare tires for that model . The British Meccano tires of that size (3,5 cm) are grey (see picture of Jan Werner). The French, of course, do not want British tires on a French/British assembled model . Distinction must be there or not? If you enlarge the photo you clearly see the Meccano imprint on the tires. Thank you, Jan, for the photograph. It is also now clear that the French factory used a different hub as well, quite plain compared to the English one, which of course came from the later tractors! Kevin. Indeed, the French used other hubs and tires for the 887 Muir-Hill. For the 887 they only used the British 562 body and the rest is typically French-made. To show the differences, I add photos of the different types of tires and hubs that were used for the different Muir-Hill Dumper Trucks. Also compared with the hubs of the later British tractors. There was also a contribution in TMT from Jan Werner about the difference in height of the French 887 compared to British 562 due to the use of other tires at the front of the 887. I therefore also show pictures of the height comparison of the French 887 Muir Hill with the British 562 Muir-Hill. Jan, more interesting and enlightening information, proof that the more we think we know about Dinky Toys, the more there is to be discovered ! Hi Jan, nice report, photos and models in your contribution above! As the extra washer for the French model is concerned, I presume you refer to the pictures below, which I dug up from my archive files (made eleven years ago already, time flies ...). P.S. 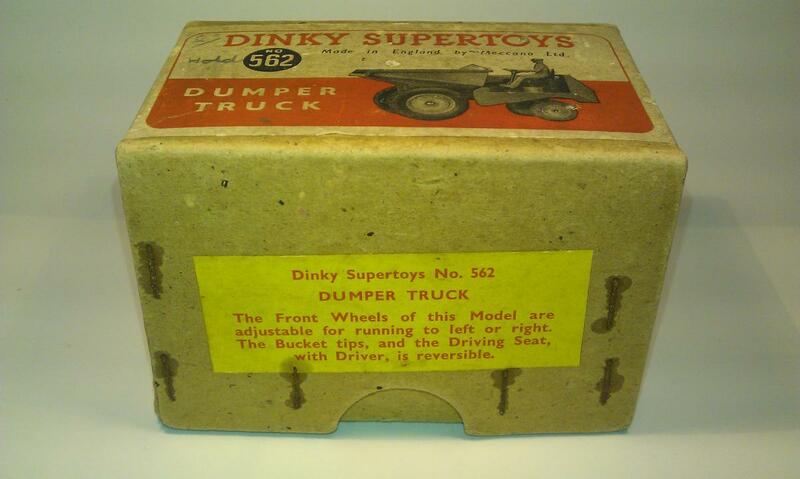 : Contrary to a first impression, by possibly consering this sturdy, solid model as a 1/48 Dinky Supertoy, the photos of the real one, and the registration in the Dinky, Dublo & Hornby Scales document do explain that the real vehicle is rather small and the scale of this model is large, c. 1/35. 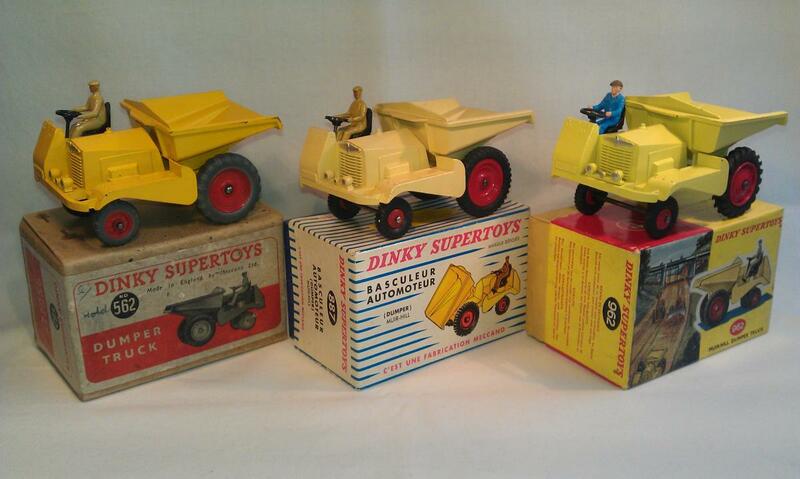 It would have been a tiny model if executed on the habitual Dinky Supertoys scale! The same goes for the Blaw Knox models listed. Jan. Thank you for your contribution with more technical details. To compensate for the difference in height between the French 887 and the British 562, according to your TMT contribution to the 887, an (extra?) washer was placed between the body and the front wheel suspension. That can also be seen on your photo. It looks like 2 washers under the front wheel suspension. And that does raise the front. I have compared my 887 once again well. According to my observation as far as I can see is there no washer between the front wheel suspension and the body of my 887, but looks like the front wheel suspension is directly riveted on the pillar of the body. But that is very difficult to see on my 887. There are two pressed-in bumps in the front wheel suspension for adjustable the front wheels for running to left or right. See pictures. My front wheel turning mechanism of the 887 is very tight. I wonder when there are washers placed between the front suspension and the body, or the turning mechanism of the front wheels can be turned too light. 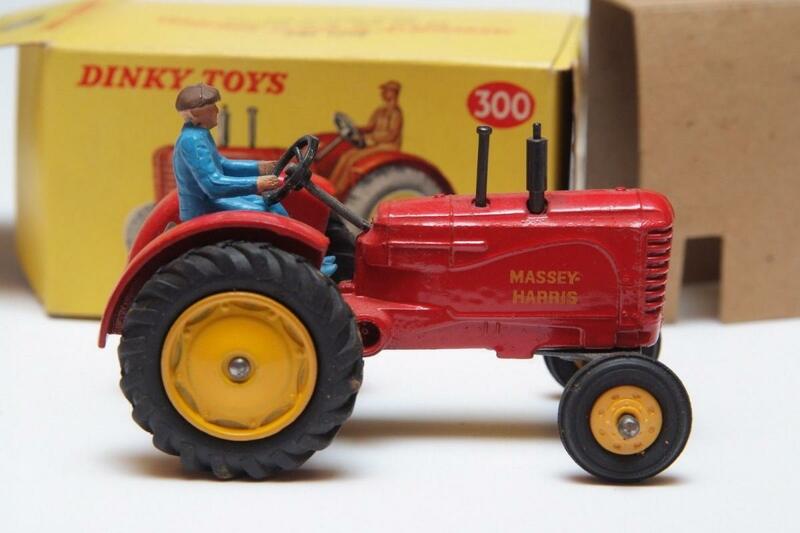 The 27a Massey Harris tractor has a similar system, but also without washers between the front wheel suspension and the body and that works very well. Apart from that, there is indeed a difference in height of about 2 mm at the front between the 562 and the 887. So they did not completely succeed to compensate the height difference. 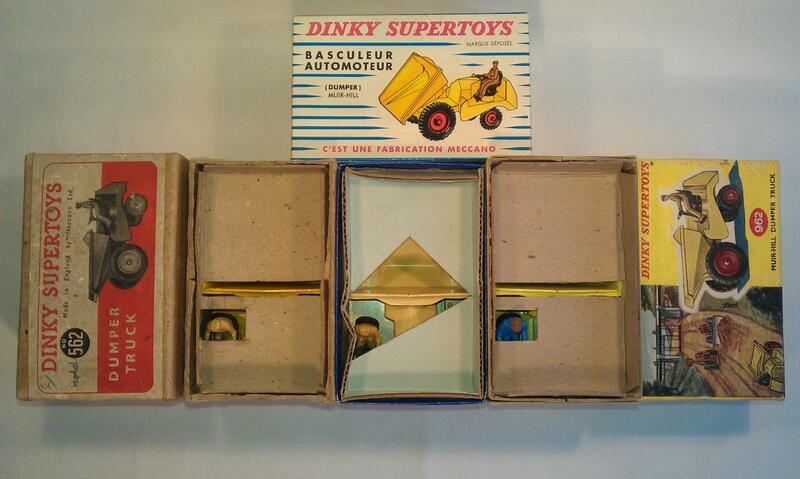 Note: Now that we have been discussing a French Dinky Toy, I have also been wondering for a long time about the existence of drawings by Meccano Bobigny. Till now I saw never any French Meccano drawing in discussions while there are shown several drawings of Meccano Liverpool. 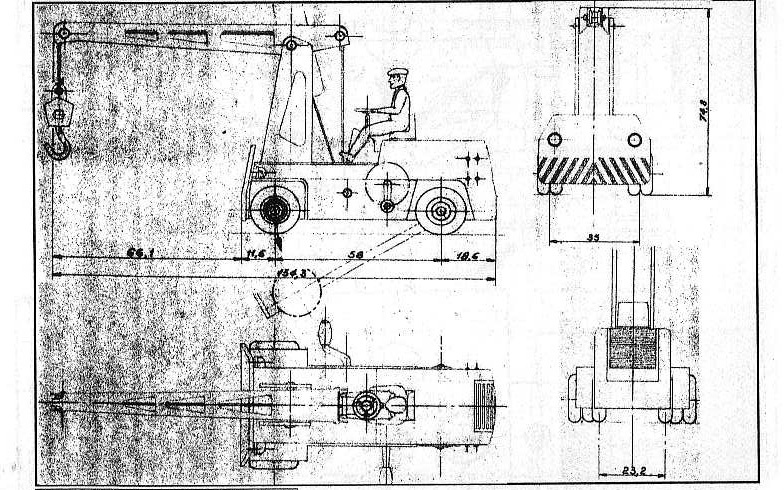 I hope Richard or Jacques do read this and can explain something about the existence of French Meccano drawings. Jan. Thank you very much for this valuable contribution. 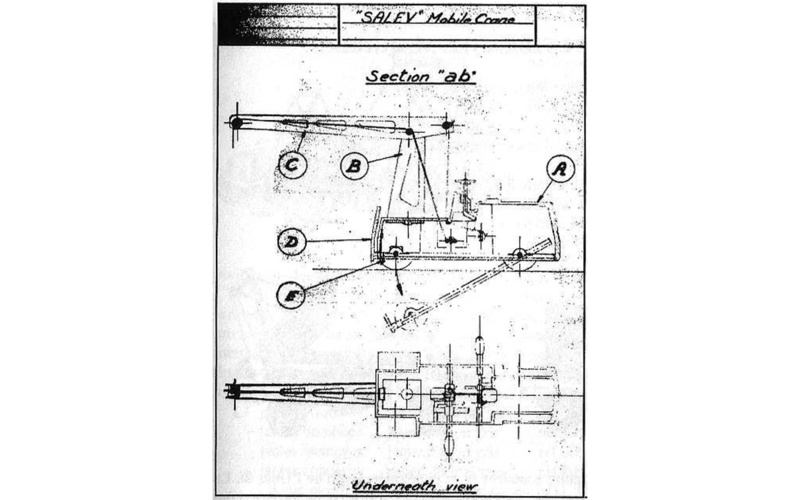 Congratulations with your acquisition of these French Meccano drawings. A valuable addition to your French collection. The special French box for the French import, British manufactured no. 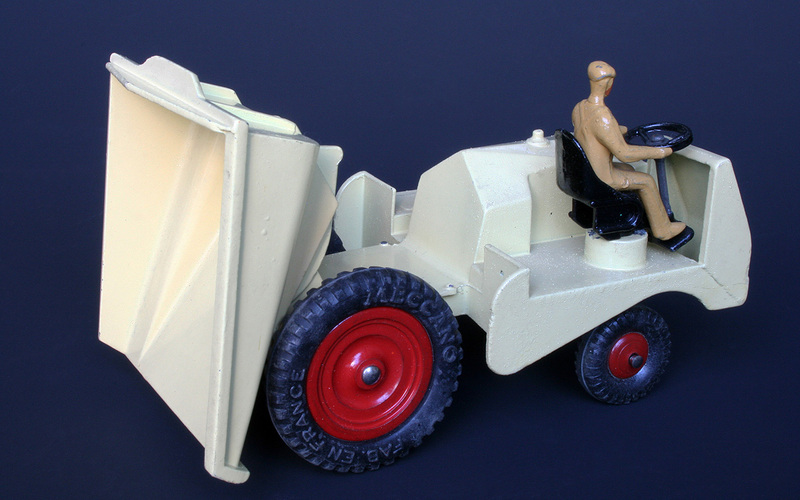 562 Muir Hill Dumper Truck (1950-1951).